I was dining at Salty’s on Alki recently and Chef Paolo Carey-diGregorio stopped by my table. He looked at me with wide eyes and a huge grin and said, “Kathy, come back to the kitchen I have something really exciting I want to show you.” I was so curious, I jumped up and followed Paolo back to the chilly walk-in cooler. He very reverently picked up a huge basket of gorgeous, just picked mushrooms gathered by his favorite forager and said, “He gave me the best he had. Have you ever seen anything more beautiful?” Gorgeous chanterelles, porcinis and morels were heaped before my eyes like gold. “I can hardly wait to make my Chef’s special with these,” he said. I felt as if he was sharing some regal treasure he had just unearthed … and truly he was. There is barely anything as sumptuous and delicious as elegant mushrooms. Mushrooms were the food of royalty and so loved by kings that historically the first known mushroom farming is attributed to Louis the XIV. Undoubtedly he would agree with Paolo that mushrooms are a food to be revered. 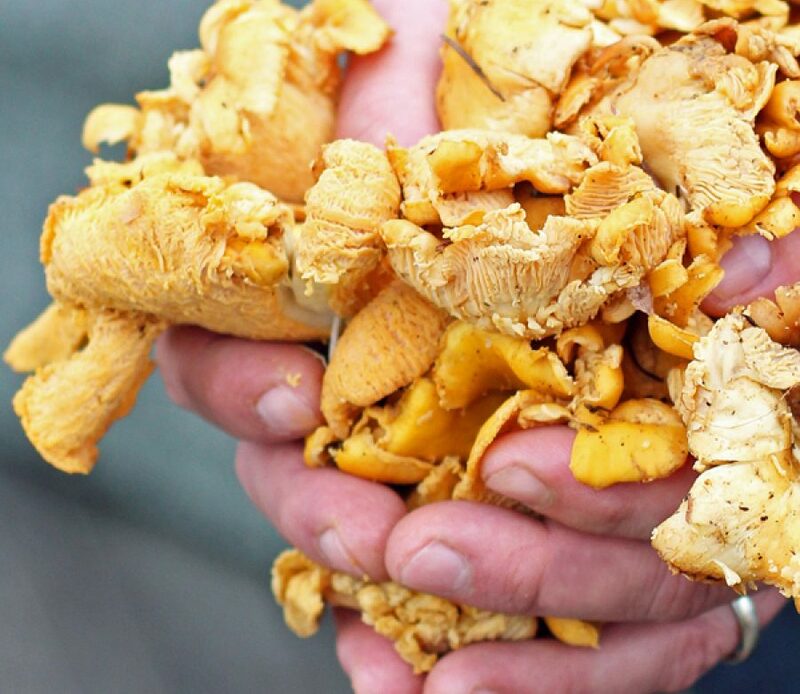 The richness, flavor and texture of mushrooms is unique in our world. In fact mushrooms have such an extraordinary cell structure and composition that they are honored with their own designated food kingdom, of which there are only three; plants, animals and FUNGI. Admittedly when mushrooms are fresh I think of them as a vegetable, and when they are cooked they remind me of meat, but scientists are right, they are distinctively in their own class. The flavor they impart is called “umami” and is so unique it is considered the fifth essential flavor (sweet, sour, salt and bitter are the other four). We invite you to come to Salty’s in November and taste the splendid ways our chefs honor mushrooms, especially in our “Aw Shucks” Bivalves Festival dish Local Oyster Stew. Chef Jeremy enriches us with knowledge of how to buy, prep and cook mushrooms in his blog The Fungus, Among Us.